The weather’s gorgeous, and you can finally haul out your barbecue. For those fair weather grillers, it’s been a long winter. 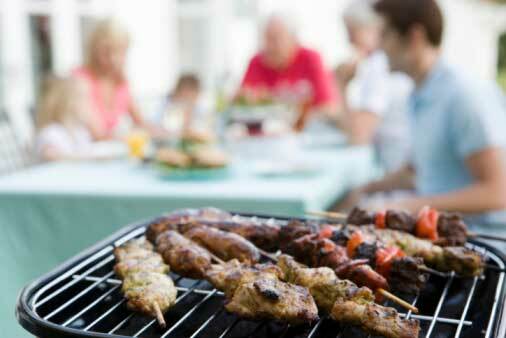 Using your barbecue can be dangerous; after all, you’ve got fire, gas, hot food, and usually a group of people around. What can you do to make sure this experience is pleasant and not perilous? Not too close to the house, the garage, or anything else that may be flammable, including patio furniture, umbrellas, or trees and shrubs. Make sure people have enough room to walk past it safely. Be aware that anything your barbecue backs against may be damaged if the barbecue is too close, this can include siding, deck rails, and fences. It is recommended to keep the grill a minimum of 10 feet from your house and make sure it isn’t underneath any overhang. Use your barbecue outside. Don’t grill in your garage, even with the door open. And never put your barbecue or your propane tanks inside the house. It might also be a good idea to have a bucket of water, a spray bottle or a garden hose nearby, to put out fires in an emergency, or to put water on a burn. Check your burners. Bugs and grease can plug tubes leading to the burner resulting in fires or even explosions. If your barbecue has been stored outside over the winter and this is the first time you are using it, it may also have become home to some small animals, so double check the nooks and crannies. Check the hoses. Just like with a water hose, make sure there are no sharp bends, blocking the flow. Look for cracks and leaks. Some experts suggest rubbing soapy water on the hose and turning the gas on. If bubbles appear, there is a leak. Don’t light the grill until you’ve replaced the hose. If leaks are ignited, they can send out huge flames. Clean the grill. Grease build-up can be a source of serious flare-ups. Stand your propane tank in an upright position. And don’t store any spare ones near the barbecue. Open the lid before lighting the barbecue. Turn on the gas at the tank first, then on the barbecue. Use either the igniter or a barbecue lighter immediately. If it doesn’t light right away, shut it off, and wait 5 minutes before trying again. Never light the barbecue with the lid closed. Use proper long grilling tool to make sure your hands are away from the heat. Close the propane cylinder first when you’re finished grilling, followed by the burner controls. Otherwise, propane may get trapped in the hose. And wait for it to completely cool down before covering it. And remember, when operating your barbecue, if all else fails, read the instructions. Your new barbecue may not work the same as your old one. It is also important to remember food safety standards. Keep cooked and uncooked food separate to avoid cross contamination. Have a thermometer handy to check the internal temperature of meat if necessary, and if something doesn’t look cooked, it’s better to be safe than sorry and throw it back on the grill. Be aware of how long food is being left out in the open, it should be refrigerated after being cooked if it is not being consumed right away to avoid bacteria growth, especially on a hot sunny day. Recently smaller portable grills have become more popular, and it is common to use them on an apartment balcony, small green spaces, or even travel with them to a beach or park. Before investing in one of these more compact barbecue’s, check to make sure your building allows outdoor cooking equipment on your balcony, and if so, make sure that you are grilling far enough away from the building or any patio furniture to avoid any damage. You would also need to make sure the area is sufficiently ventilated. Finally, don’t forget to confirm you have sufficient insurance on your home. Having the right coverage will go a long way to help ease the pain if a fire does break out, or someone is injured on your property. All home insurance policies also include liability coverage, which applies if someone is injured on your property and you, as the homeowner, could be held legally responsible. It is becoming more common now for homeowners to consider higher limits of coverage for liability, so make sure you discuss your needs with your provider to see what they recommend. Fire is also an insured peril on all policies, even the most basic ones. Check with your home insurance provider to confirm that all of the personal property you own would also be included in the event of a loss. In some cases, you may need to add coverage for specialty property: things like fences, gardening equipment, sporting equipment or detached structures like your shed. Follow all these tips, and have a safe and happy barbecue season. For more information, or to get a home insurance quote, contact Square One at 1.855.331.6933.